I just lost a perfectly good draft. Next time, remember to SAVE the draft, just in case. Ugh. Let’s try this again. Ever heard of National Book Store’s AngPao Loot Bags? If I didn’t read Daphne’s post, I wouldn’t have known of it either. I took some time out to check my email and browse a few blogs on the afternoon of the Chinese New Year and saw the post. Lucky for me, I still had time to swing by an NBS branch before closing time. Of course it meant delaying my return to the vigil for Papa’s wake (related story). From home, I had decided to pass by the Church to find out if anyone needed anything. Before getting there, I saw Che and her daughter Hannah. I offered them a ride to Puregold. Che needed to get a white shirt for her and her hubby, for the burial the next day. I said I’d take them if Hannah agrees to pick up something for me at the National Book Store. Deal. 8 slices of salmon sashimi cost me a hundred pesos. It wasn’t the best, but I wasn’t complaining. I know I’ve always said that a good sashimi is ruined by the ice that clings to the fish meat from being frozen, and these still had ice on them, but I enjoyed them anyway. While Hannah finished off her rice meal, I told them about my agenda at the NBS: the AngPao loot bag. Che was interested. She wanted one too. National Book Store at the Federaland Condo along E. Rodriguez was on the way back to church. Unfortunately, the sales ladies didn’t seem to be aware of any angpaos other than the paper envelopes they carried. So no luck there. I thought I’d have to wait until Chinese New Year 2013 for a chance at this deal, but Che said we might as well checkout the Panay Avenue branch. Good decision! The contents of our bags (Che got one too) were very similar, except for the card and paper bag designs. Daphne’s loot was the same too, except for the book. We got Toxicology, by Jessica Hagedorn. Image is from this review of Toxicology from the Philippine Daily Inquirer website. I am looking forward to using all the stuff in the bag. Pencils, markers, ballpens, and scrapbook stuff. I’d love to start reading the book too, but it will have to wait. It’s 12 months away, but already, I’m looking forward to next year’s loot. A very belated Kung Hei Fat Choi! 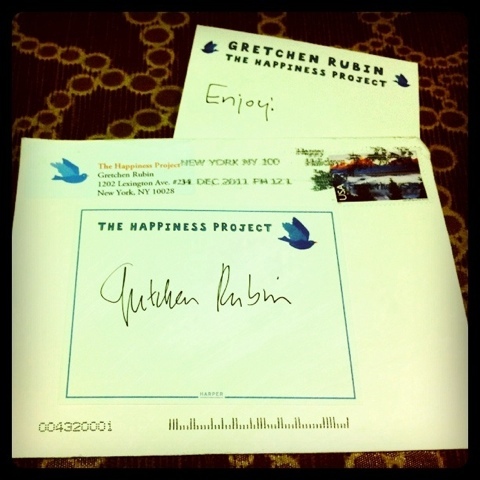 I don't really put book plates on my books, but when "The Happiness Project" author Gretchen Rubin posted on her blog of the same title that she would be glad to send out autographed book plates for those who already own the book, I signed up! 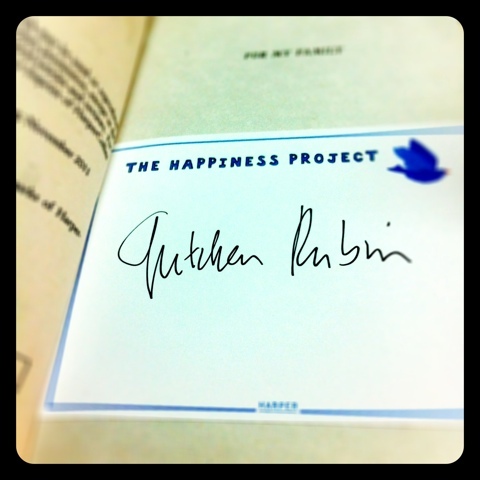 The book plate, with a handwritten note (short and simple: Enjoy!) actually arrived here before I even opened the book. The book was a Christmas present (Thank you Lally, if you're reading this!). Now, I've adhered it right on the dedication page of the book.